What level of expertise do institutional decision makers have to critically evaluate and understand efficacy research and whose responsibility should it be to prepare institutional leaders and educators to make EdTech purchasing decisions? What are the schools of education doing to prepare institutional leaders and educators to make EdTech purchasing decisions? What are the best practices in preparing institutional leaders and educators to request, interpret and use efficacy research to make decisions? Edtech is a vital precursor to “work tech”—the tools that today’s students will need to leverage in college, career training and eventually the workplace. In an economy that is moving rapidly in the direction of more independent workers executing high-level projects for a variety of employers, navigating an ever-changing ecosystem of new technologies will be a fundamental skill for workers. Students need access to tools that work. But today, the decisions educators make regarding the tools they use with students are based on hypothesis rather than solid evidence. School, district, and state leaders make technology decisions every day that will affect student tech fluency, not to mention learning outcomes. These decision-makers spend billions of dollars on equipment and resources to implement their decisions. The New Schools Venture Fund estimates that K-12 schools collectively spend about $9 billion per year on instructional software, digital assessments, laptops and tablets for students and teachers. But how do these leaders know whether their investments will lead to the student learning outcomes they desire? What methods of evaluating whether the tools work will lead to selection of the best tools for learning? Unfortunately, many of them may never know because there simply is not enough rigorous research about what works—and good, existing research rarely makes it to the policymaking table. What’s more, high-impact practices and technologies remain comfortably at the “pilot” stage, never achieving the transformative scale they promise because little is known about effective scaling across diverse school and district contexts. The time has arrived to dig in and empirically investigate what works. For much of the past year, approximately 150 researchers, policy makers, entrepreneurs, educators, investors, and institutional leaders have been collaborating in 10 working groups (each supported by a professional researcher) to study and discuss data, processes, and systems that show substantial promise. This May, these leaders and another 150 or so stakeholders will come together for the first ever EdTech Efficacy Research Academic Symposium, organized by The University of Virginia Curry School of Education, Digital Promise and the Jefferson Education Accelerator. At the symposium, we will continue to develop a shared understanding of the concrete steps we can all take to ensure that real research drives the development, selection, and deployment of education technology. We hope this will kick off a more intense effort to advance research that leads to better policy and practice in both adopting and using technology. Rather than thinking of technology as a tool for implementing old forms of pedagogy, we must broaden the notion of what great teaching looks like—and the role of the teacher. Teachers aren’t becoming less important in the era of rapidly emerging technology; rather, they’re becoming the critical navigators of of newly available tools and information. Research and technology communities play an important part in helping teachers and leaders effectively serve that role. The Alliance for Excellent Education has been addressing the challenge of leveraging new educational technologies to make education delivery better. Working with 60 education partners and the U.S. Department of Education, we at the Alliance for Excellent Education have created Future Ready Schools—a project that helps school district leaders implement digital learning strategies that personalize learning and better serve the future needs of students and the neighborhoods where they will live and work. So far, 3,100 school districts have taken the Future Ready pledge. To best support these education leaders as they deploy proven digital learning strategies, we need to continue investigating effective practices and offer solid evidence regarding the fidelity of new tools and approaches that continually emerge. The EdTech Symposium is designed to jumpstart this process and inspire increased collaboration between tool developers who aim to create exciting, engaging technologies and educators who aim to ensure that every student has access to the high-quality education she or he needs and deserves. By starting the dialogue, we aim to spur deeper, more research-driven conversations that lead to the educational transformation our nation requires. This article originally appeared in EdSurge on March 4, 2017. Editor’s note: EdSurge is participating in the EdTech Efficacy Research Academic Symposium. Bob Wise (@BobWise48) is the president of the Alliance for Excellent Education and former governor of West Virginia. Bob served a combined twenty-four years as governor, member of the U.S. House of Representatives, and state legislator, Led by Gov. Wise since 2005, the Alliance for Excellent Education has become a respected advocate for the Common Core State Standards, deeper learning, Linked Learning, digital learning, adolescent literacy, and other key education policy issues. Before joining the LEAP team, Amy was an independent consultant for program evaluation and data systems after almost a decade with Chicago Public Schools. At CPS, she led the effort to produce comprehensive school scorecards and designed processes for principal eligibility and evaluation. Through his 4 years at RMMS, Benjamin has led the school as a Digital Promise Verizon Innovative Learning School, where students received 24/7 connectivity as a 1:1 iPad School. Under his leadership, Rancho Minerva has been in the national spotlight as a P21 Exemplar School for their unique approach to teaching and learning. Benjamin is the founder of Deans for Impact, a national nonprofit organization working to transform the way we prepare teachers in the U.S. He formerly worked as policy director for NewSchools Venture Fund and as Deputy Attorney General for the state of California. R. Brad Lane is the Chief Executive Officer of RIDGE-LANE Limited Partners, an investment-bank founded with The Honorable Thomas J. Ridge, which sponsors public-private partnerships to improve the nation’s infrastructure, economic development programs to spur growth in metropolitan cities and specialty venture development for private growth companies. He founded Lane Financial Corporation, a multi-family office providing global wealth management strategies for high-net-worth individuals, where he served as Managing Partner of Atlas Capital, the $12 billion subsidiary B/D structuring initial public offerings in Technology & Healthcare and alternative investments in Real Estate. Dave is the Associate Dean for Research in the College of Education and Human Performance at the University of Central Florida. His work focuses on the use of technology to enhance teaching, learning, and performance. Dave also serves as editor of the Journal of Research on Technology in Education. David previously served as Commissioner of Education for New York State, as the Klara and Larry Silverstein Dean at the Hunter College School of Education, and as Director of Education at the National Endowment for the Arts. His insistence on including major funding for curricula in the State's Race to the Top grant led to the launch of EngageNY, the nation’s most consulted on-line curriculum resource. Ellen is also a faculty member in the Department of Mathematics, Science, and Technology. She is co-chair of the University of the State of New York Council on Technology Policy and Practice. Ellen began her career as a teacher in a federal experimental school program in Minnesota. Glen is also a professor of instructional technology in the Curry School of Education. He developed one of the nation’s first statewide K-12 Internet systems, Virginia’s Public Education Network (PEN). Glen is a founding member and past president of the Society for Information Technology and Teacher Education (SITE). Michael is a professor of learning technologies. He previously served as president of AECT, editor of ETR&D, editor of the SAGE Encyclopedia of Educational Technology, and editor of the Handbook of Research on Educational Technology and Communications (3rd, 4th eds.). Jeffrey previously served as the President of Catapult Learning from 2001 to 2006, when the company was a division of Educate, Inc. In 2008, he oversaw the sale of the business to JMI Equity and The Carlyle Group. Prior to returning, Jeffrey served as the President and CEO of Sylvan Learning for seven years. Jeremy previously worked at Mentor Public Schools as Director of Innovation and Educational Technology. He is the Chair of the International Society for Technology in Education's (ISTE) Technology Coordinator's Network and the Past-President of the Ideastream Advisory Council. In 2015, Jeremy was recognized as an Apple Distinguished Educator. Karen's work centers around K-12 personalized learning, including measuring product efficacy and spurring development of ed tech tools that meet the needs of teachers and students. Previously, Karen spent a decade marketing and building K-12 digital tools in social studies, science, math and language arts. Kate helped create CfA and designed CfA’s project-based CBE model. She is a NEASC/CIHE Commissioner and directs a $3.93 million FITW grant project to develop CBE alternatives to developmental education. Kate came to SNHU from ETS, where she was Executive Director of Higher Education. Kay is Professor of Instructional Technology at the University of Wyoming (UW) and the current President of the Association for Educational Communications and Technology (AECT). Previously, she taught high school math and served in multiple higher ed administration roles including dean of the UW College of Education. Kinshuk is the Dean of the College of Information at the University of North Texas. His research interests include learning analytics; mobile, ubiquitous and location-aware learning; and cognitive profiling. Lou has more than 25 years of experience developing a wide variety of technology solutions to radically improve teaching and learning outcomes. He previously served as founding CEO at Blackboard, as a senior vice president at ETS, and as president and CEO of Moodlerooms. Robert is a nationally-recognized expert in both early childhood education and K-12 teaching and learning. His research and policy interests focus on teacher-student interactions and relationships and their contributions to students’ learning and development. Teresa S. Foulger is an Associate Professor of Educational Technology at Arizona State University. She is an expert in professional development and organizational structures that create lasting change in education, especially where technology is integrated into teaching and learning opportunities. 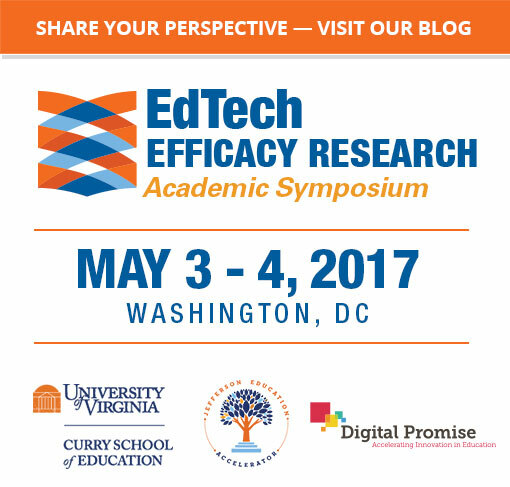 In Washington, D.C. on May 3 and 4, 2017, the University of Virginia’s Curry School of Education, Digital Promise, and the Jefferson Education Accelerator hosted a symposium focused on the role of efficacy research in the development, adoption, and implementation of educational technology. The symposium represented the culmination of a year-long collaboration among stakeholders that rarely collaborate in support of education technology: academic researchers; entrepreneurs; district and university leaders; investors and philanthropists; and teachers and professors. Review highlights from the symposium’s over 55 presenters and consider symposium participants diverse ideas for moving efficacy to the center of the discourse concerning the development, adoption, and implementation of technology in education.